Volkswagen USA is running “Feeling Carefree”, a 45-second commercial featuring a rehash of the 1985 A-ha animated music video hit “Take On Me“. 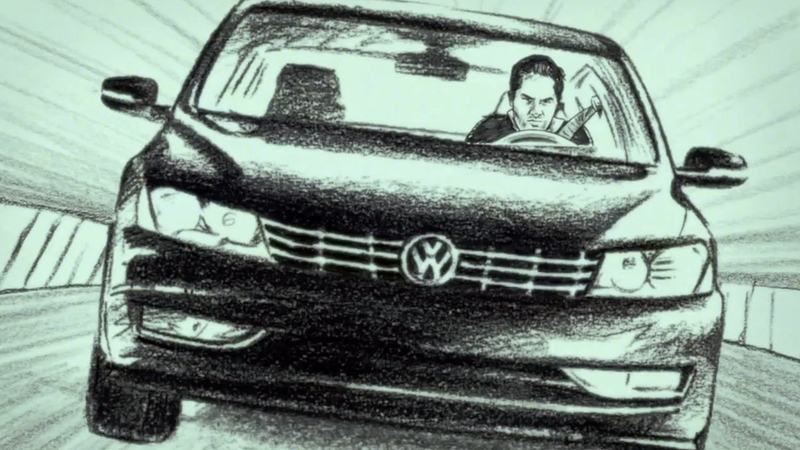 An executive daydreams about his new Volkswagen in pencil sketch-style animation before coming back to the boardroom, crooning aloud. “Is that me? Was I singing?”. The ad finishes with a plug for Volkswagen’s Carefree two-year no-charge scheduled maintenance plan available on new cars. The Carefree campaign was developed at Deutsch by executive creative director Michael Kadin, group creative director Matt Ian, creative director Mark Peters, associate creative director Ryan Scott, director of integrated production Vic Palumbo, director of content production Victoria Guenier and executive integrated producer Jim Haight working with Volkswagen of America interim chief marketing officer Wayne Brannon, marketing communications general manager Justin Osborne, advertising manager Jeff Sayen, advertising specialist Chanel Arola. Filming was shot by director David Shane via O Positive with executive producer Marc Grill and line producer Ken Licata. Editor was Jim Haygood at Union Editorial with assistant editor Dylan Firshein, executive producer Michael Raimondi and producer Joe Ross. Post production was done at Company 3. Animation was produced at Passion Pictures by head of production Anna Lord, executive producer Alex Webster, producer Matt Saxton and director John Robertson. Sound was produced at Lime Studios by mixer Mark Meyuhas, assistant Matt Miller and producer Jessica Locke. Music is “Take On Me”, performed by A-ha, courtesy of Warner Bros. Records Inc. & Sony/ATV Music Publishing. The official video for a-ha “Take On Me”, filmed by Limelight Productions director Steve Barron, was released in 1985. At the 1986 MTV Video Music Awards, the video for “Take on Me” won six awards: Best New Artist in a Video, Best Concept Video, Most Experimental Video, Best Direction, Best Special Effects, and Viewer’s Choice—and was nominated for two others, Best Group Video and Video of the Year. It was also nominated for Favorite Pop/Rock Video at the 13th American Music Awards in 1986.